We had so much enjoyed the previous Rheinland-Pfalz-sponsored Plandampf in 2000 that the 2002 event, based around Limburg and partly in Hessen, was a must. Accordingly I set off a few days after returning from the 1501 tour in the Netherlands, and still complete with Victor Meldrew’s cold (see Netherlands, 27.9.02-29.9.02). My notes were somewhat curtailed, and outweighed by the pictures this time, so the pictures are all at the foot of the page. Unearthly departure at 0505 for BHX, to get 0730 BA flight to Frankfurt, booked as an Embraer RJ. After something of a saga it turned out to be an A319 with only seats A to C booked, so a bit lopsided apart from a few late arrivals in D to F. Some messing around at FRA so eventually we were about 25 late into the terminal which was no great loss. S-Bahn to F-Hbf as usual followed by PR’s realisation that we could get an RE to Giessen and continue to Limburg behind 03 1010. This we did, lunching partly at Frankfurt Hbf (Henniker and bratwurst) and partly at Mr Jones’ in Gießen (unknown weizenbier and an equally unknown house beer but all good stuff). Excellent thrash to Limburg with 03 1010 which was given plenty of stick. Quick wash and brush up, just missing the last two kettles but in time to be propelled by 215049 so that we could pick up the 41 coming back on 1808 from Koblenz. 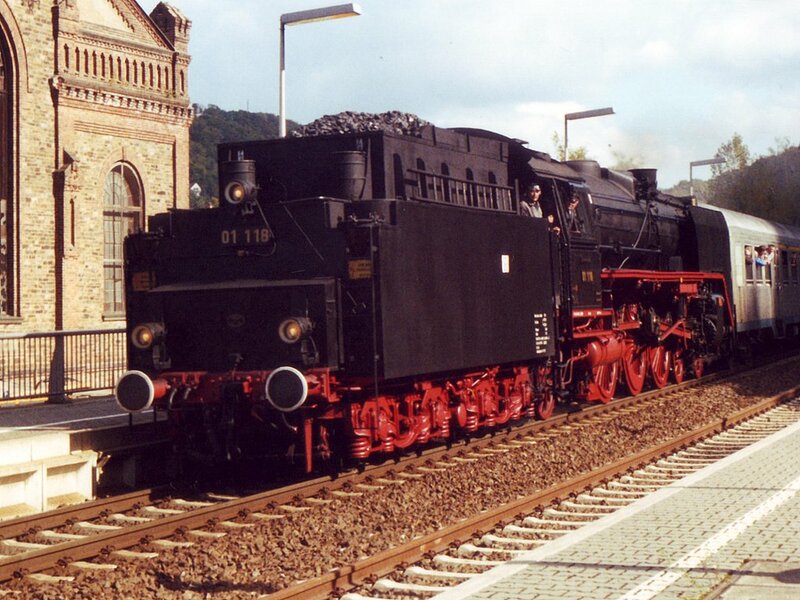 This was taken from Friedrichssegen back to Limburg, double headed by 41 and 03. Though late, they were in vigorous form. Limburg turned out to be full and we ended up in an expensive Italian restaurant where a fillet steak was rather wasted on my cold. Total chaos in the Mercure’s breakfast room. Not impressed. A certain amount of dieselisation was in evidence at the station. 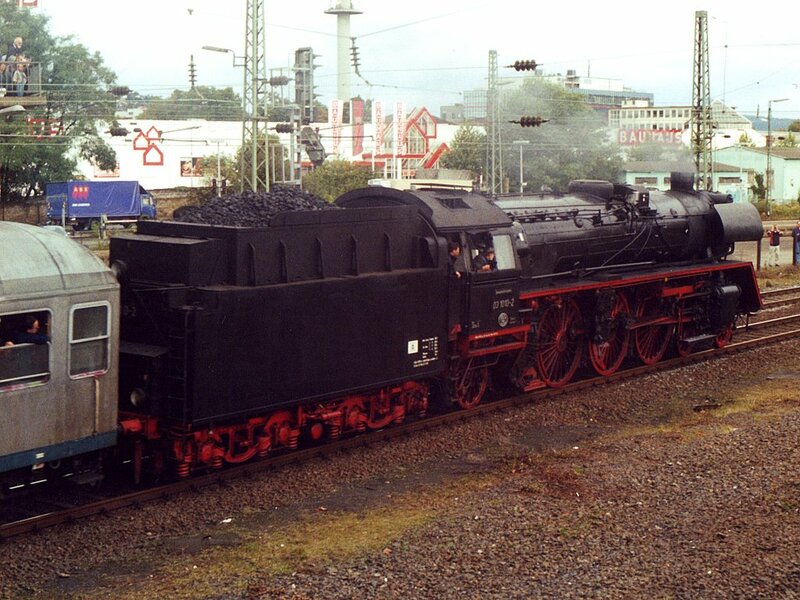 0913 to Koblenz turned out 212 063, albeit very smart in its maroon ‘old’ DB livery. 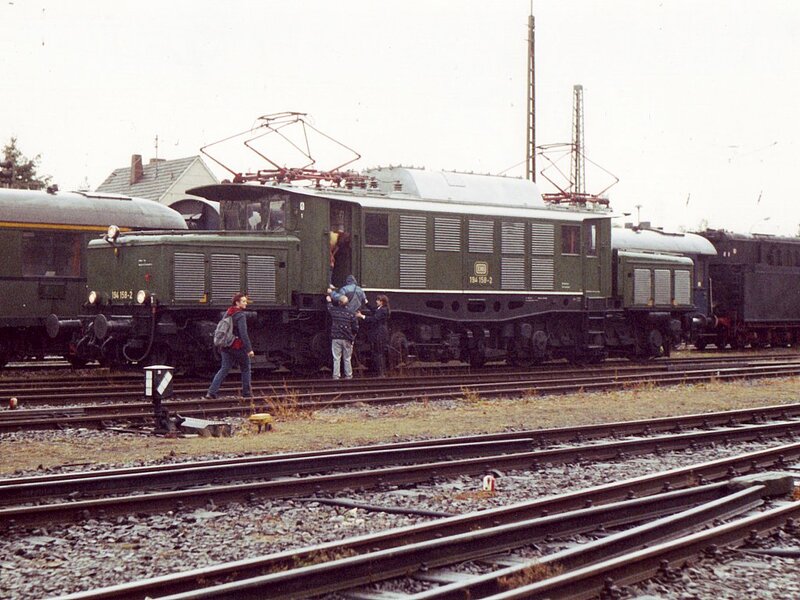 The selected phot spot was Balduinstein where 52 8134 went west on the Limburg-Brohl special, followed shortly after by 01 118 heading (?it was tender first) east. Onwards by kart to Friedrichssegen where the P8, 2455 was also going eastwards backwards and we joined 03 1010 going westwards backwards to Koblenz. ‘Refreshment’ in the form of a McDonalds and a none too wonderful weizenbier were taken before returning with the 212 as far as Bad Ems West. Here the 01 was photted (backwards again) before continuing on to Nassau and Limburg. Final bash was with 50 3740 to Siershahn and back, the station gaststätte being the first place properly geared up with an outside bar and barbie. Königs Pilsener and pork steaks were taken before returning to Limburg for two attempts at finding a pub where we could sit down. Nice weizenbier though. Amazingly, no notes taken at the time, nor the following day. 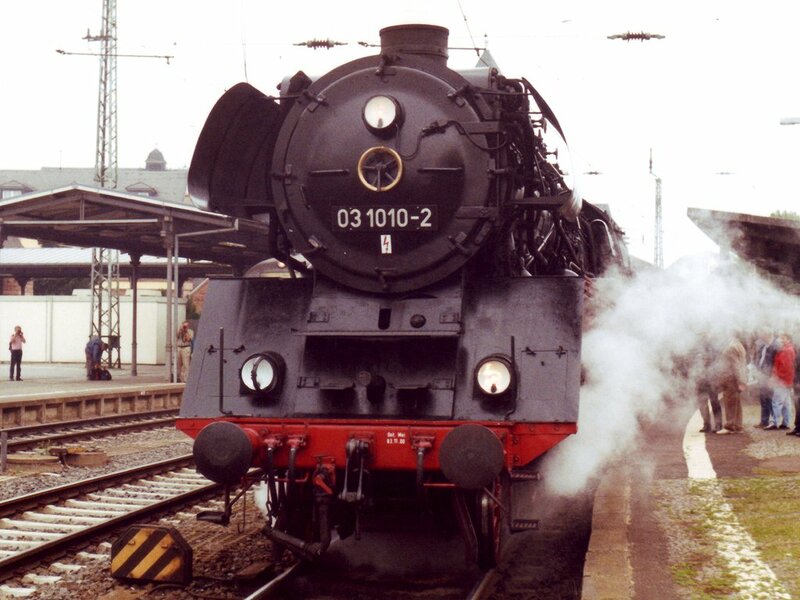 However, from memory: we started by going up to Hachenburg with, er, a steam engine (a 41 I think, will have to look at the video) and then back to, er, yes, where was it – Nistertal? – where there was a small exhibition and the official ‘opening ceremony’ at which local bigwigs blathered on interminably in the way that they do. Not being able to understand what they were saying made absolutely no difference! The band played, beer was taken and it was bloody cold. Nice to get back on a warm 628 to go to Limburg, thence to Koblenz pausing at Bad Ems for phots. We eventually made our way to Linz (Rhein) where the society running the Kalenborn preserved line were having a good old hooley. Beer was taken, naturally, and 01 1066 which had arrived on a special was admired. For the occasion the preserved line was using 0-10-0T 94 1538 instead of the usual ferkeltaxi and this proved surprisingly sure footed on a very steep gradient in very heavy rain. [I do recall several sacks of sand going on the running plate at Linz, mind you.] As befits an ex-rack line the loco stays at the downhill end and runs with chimney uphill (presumably for water level purposes, not purely to mess up your photos). 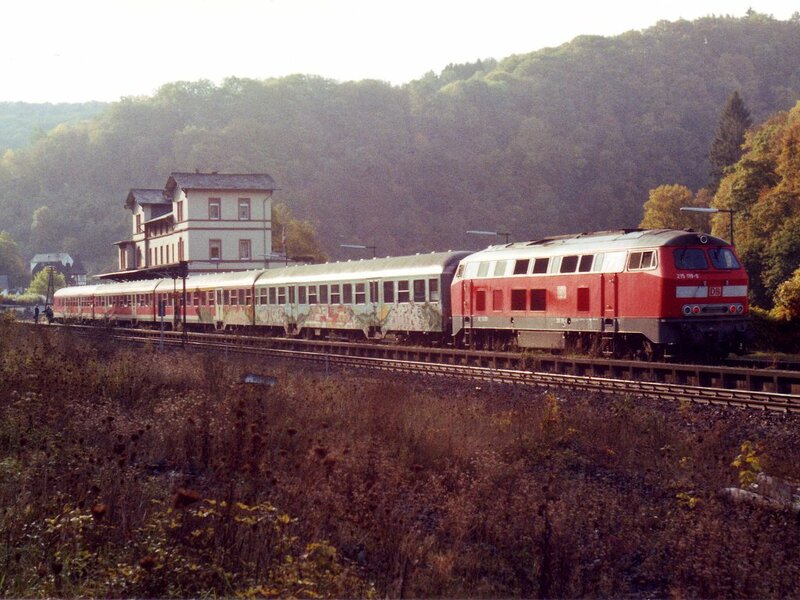 Anyway, not a bad little bash one way and another, and it used P3 at Linz which has booked DB passenger services. Back to Limburg on assorted karts, pausing for an excellent schnitzel (my cold, acquired from Victor Meldrew en route from Amsterdam last time out and still afflicting me, relented to allow me to enjoy this) at the Italian opposite Koblenz Hbf. Again no notes at the time; but having radically overslept we just made it to the first Gießen train, H grabbing breakfast for us at Limburg station. We returned from Gießen to Wetzlar for photting purposes. Back to Gießen again, thence by kart to Frankfurt Hbf, S-Bahn to the airport, Airbus to BHX, and car to Telford. In those days of actually earning a living, I could always find an excuse - so November saw two weekend trips to Germany by courtesy of some special offer fares to Düsseldorf. 03 1010 looking suitably impressive, but at a location which I completely failed to note! 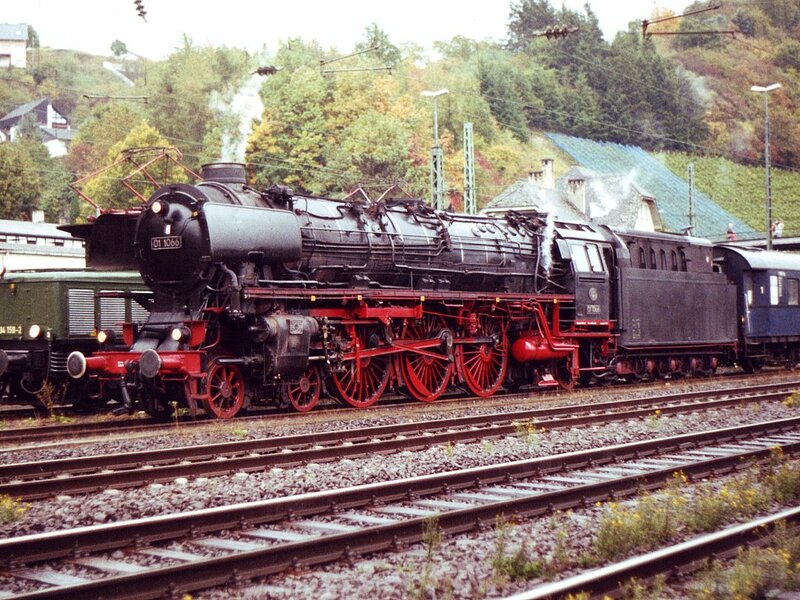 215 119 at Balduinstein on 4.10.02, propelling (note the tail lights) a Limburg-Koblenz train. 01 118 coasting into Friedrichssegen on the way to Koblenz on 4.10.02. Unlike the 2000 event there were no circular routes and consequently there was more tender first running that one might have liked! Preserved electric 194 158 at Linz (Rhein) on 5.10.02. 01 1066 at Linz with the stock of a special in connection with the plandampf and a steam weekend on the Linz-Kalenborn preserved line. 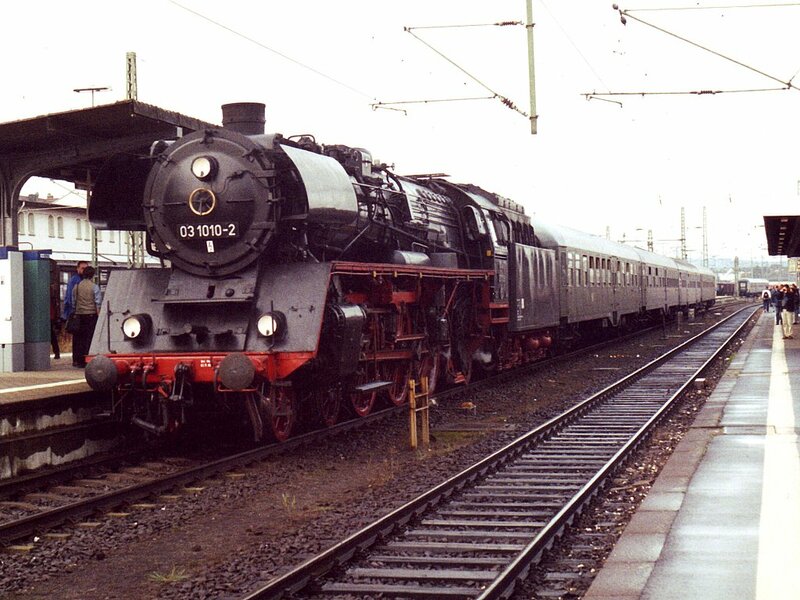 03 1010 again, this time making its way into Wetzlar on the morning of 6.10.02.